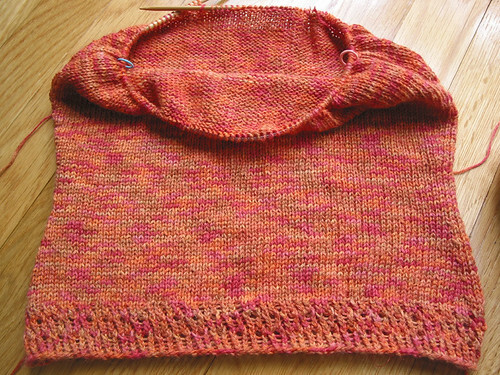 I'm still super-motivated to knit the Skater's Undertop. 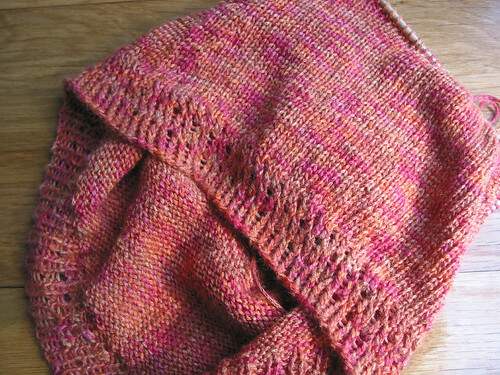 The yarn is Debbie Bliss wool/cotton that I bought at Webs two years ago. Only slightly marinated (I have things much older in the stash). 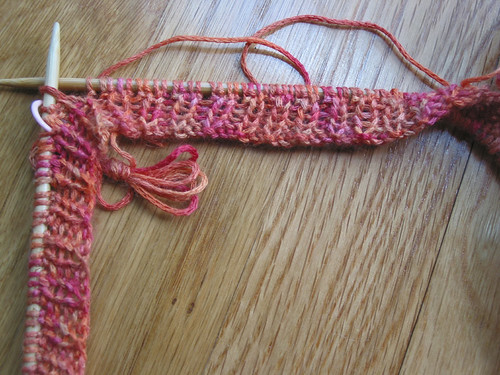 It feels very cotton-y, but at 50% wool, it's the most wool I've been knitting with lately, so it feels like r-e-l-i-e-f to my hands. 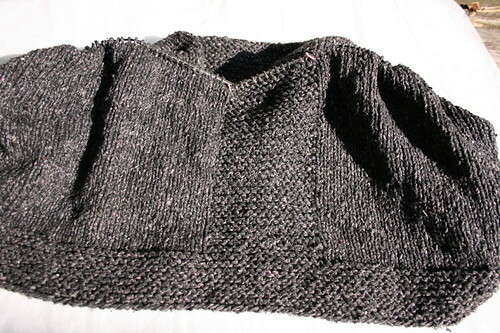 I love the simple cable detail, and how it carries up over the shoulder to the neck. I also appreciate the in-the-round construction. I like the shape/fit and know this is something that will become part of my wardrobe, even with the wool content (I just won't wear it at home). And the mostly-stockinette knitting is perfect for my current state-of-mind. Ah yes, and the anticipation of the first sweater post-pregnancy. All these keep me going at a good clip. 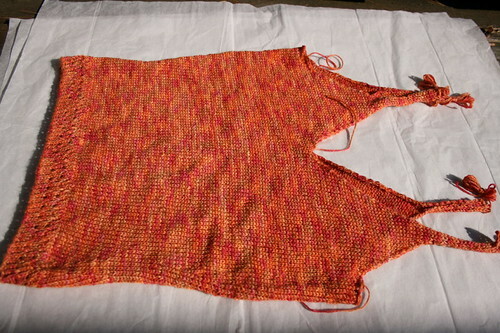 I know I won't be comfortable with a belly-baring top or 3/4 sleeves so I'm adding length to the body and the sleeves. I've been trying it on as I go, too. I really want this to fit well. Sorry for the crappy photo. 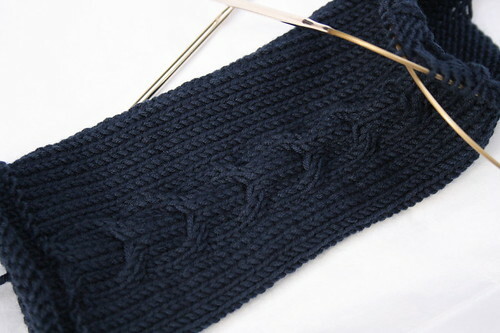 I'm getting used to the 7-into-5 stitches, which require knitting the same 7 stitches together 3 times. Addi Lace needles come in handy for these manoevers. 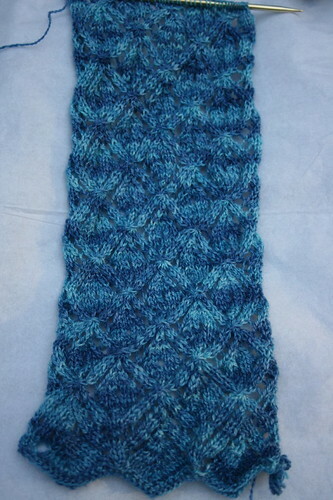 But I'm not digging the short rows (I took out a repeat because of my limited yardage. 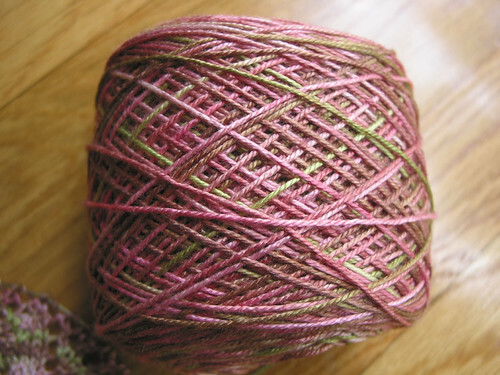 Who buys only 1 ounce of laceweight? Who??). It's hard to get into a rhythm before the row ends and then I have to figure out how to start the next one. Somehow I can't memorize the first few stitches of each row, but I'm golden after that. 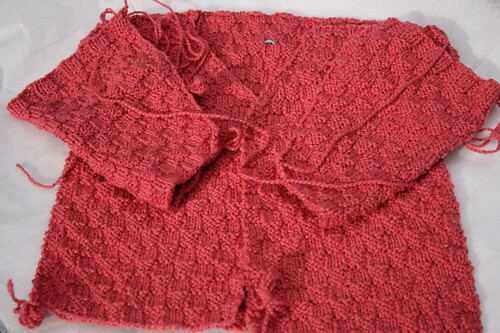 I feel like this is a project I'm finishing to finish, because I want to use the yarn. Which is fine. It will be beautiful. I just wish I could enjoy the process more. I'm almost to the armpits now. The cotton/silk is hard on my hands so I work on it in spurts. Wanting to get this done for Scott keeps me going. Also, occasionally, guilt. I started Honeymoon Cami in April 2006, lost steam, then got pregnant and wasn't sure I'd be able to wear it afterwards, so it sat. After I got a question on it on Ravelry, I pulled it out to check gauge. I realized I didn't have that much more to go, and that it seemed like it not only would still fit, but would also be flattering. And the colors are great. 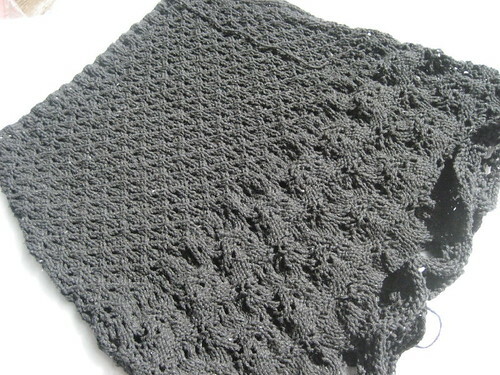 But perhaps most importantly, I'd be able to quickly reduce my WIP count to squeeze in another project. So I finished it. 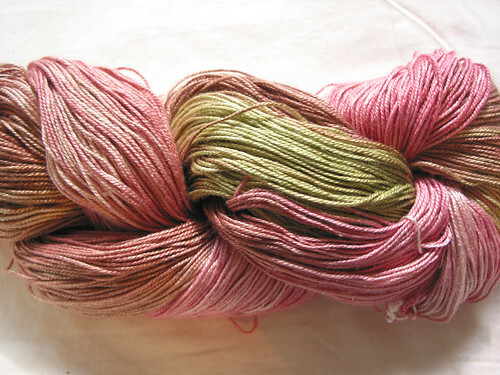 More non-wool: SWTC Bamboo. 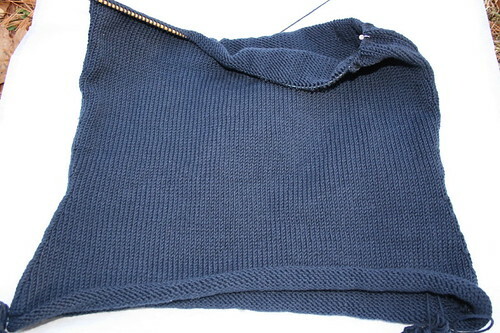 Everything is sewn up, just needs a quick block. Look how much darker it got! Just kidding. I almost wore this at Rhinebeck. In the hotel room, with Scott's help, I cable-plied some yarn to make the waist-tie. I even remembered to bring a slip. The only problem was... shoes. Picture the above with slip-on cloggy mocs and handknit ankle socks. Dor-kay. My first time working with Mission Falls 1824 cotton and I find it quite nice. For cotton. This is the 12 month size so I hope Lily will be able to wear it for more than a month or two. Motivation: something cute for her to wear. Lack of motivation (for sewing it up): knowing it's too big for her anyway. Different projects, different motivations. What motivates you? Enablers all! Hehe. My eye is on a Patrick Green Fancicard, which is even more expensive than the Fricke/Strauch I had been looking at. My reasoning: I'd prefer to buy one carder that will last me a good long while. I'm afraid that if I got a Louet I will want to upgrade too soon. I'd like to card in silk with merino, cashmere, alpaca, yak... and the Fancicard is supposedly very good at handling the exotics. Gotta save those pennies. I might be picking up some part time programming work, though. And my birthday is around the corner (2 weeks!) so if I have any discipline (not likely) I might be able to put a few bucks towards one. The sun is out today (yay!!!) so I took a few pictures. 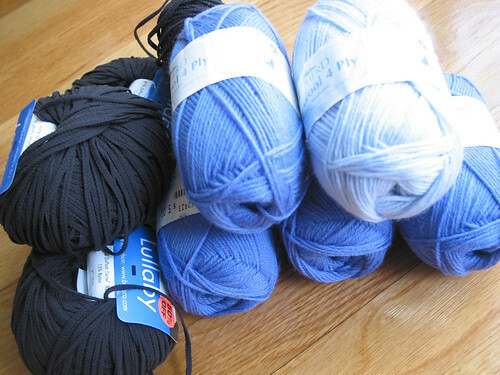 The plan is to navajo ply and possibly make socks. I added a few inches at The Fabric Place Knit Club last night. 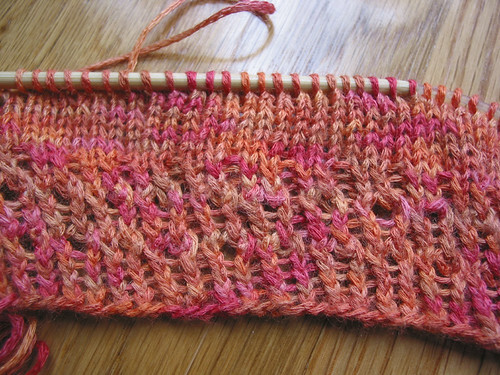 I love seeing the transformation from skein to ball to knitted item in handpainted yarns. 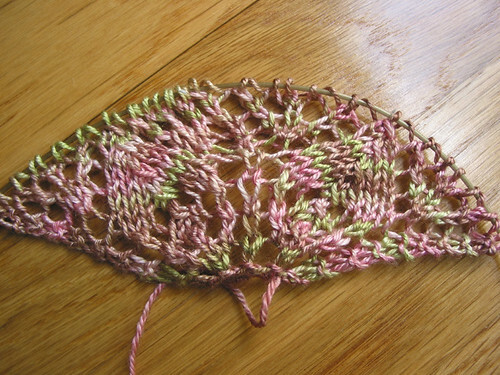 I'm hoping that this one skein will be enough (~550 yards) but I think a shawlette would be fine, too. So let's see, there's been a lot of stuff going on. Where to start? I'm going to see the Harlot speak at Classic Yarns of Grafton tomorrow! I'm hoping I won't say something really stupid or embarassing. Or gush too much. Or smile too widely and not say anything. I'll be meeting up with my buddy Maria and she'll stop by the house afterwards to gawk at the stash. Go on, admit it, you're jealous. You want to see the stash! Superwash baby yarn and non-wool for Scott in Scott-safe colors! Taxes were a very pleasant surprise this year. I was hoping we'd break even or not have to pay too much. Instead, we're getting money back! Woohoo! I promptly ordered Woolcombs' mini wool combs from The Artful Ewe so I can process some of that lovely alpaca and llama that shipped with my wheel. June had recommended them and I'm excited to try them out! As if that weren't enough... today I stopped by Woolcott in Harvard Square and bought Heirloom Knitting, mostly subsidized with a gift certificate. Couldn't put it down. Can you stand it?? Can I??? 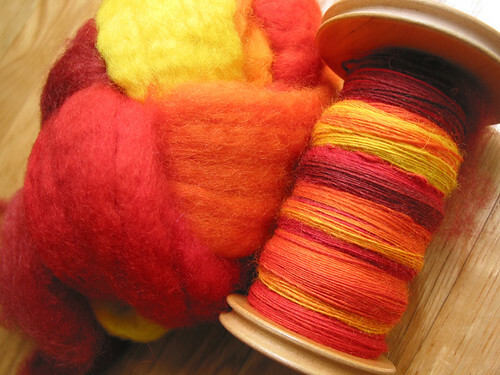 And last, but not least, there's some handdyed silk roving wending its way to me. No more on that 'til it arrives. Hoooo boy.